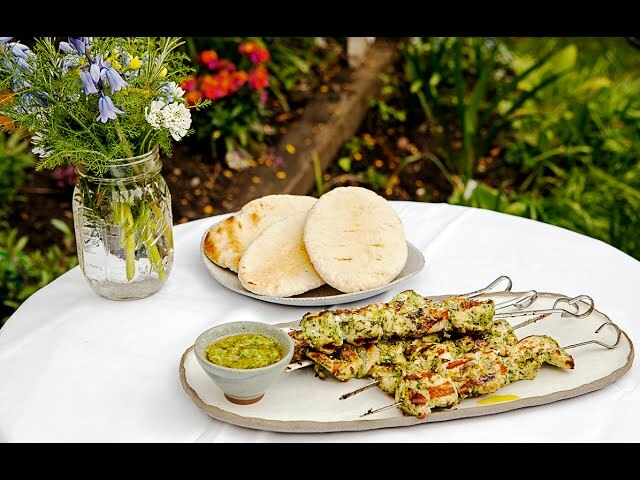 Lisa Faulkner - Chimichurri Chicken KebabsBright green Chimichurri is a light and flavourful Argentinian marinade traditionally used to season the flavour of meat, what better way to dine and impress this BBQ season! These chicken skewers are really eay to make, and the kids will love to get involved too. The marinade keeps the chicken moist and flavoursome. Heat the bbq to good and hot. Thread the chicken onto metal skewers bbq for 6-7 minutes, turning until lovely and charred and cooked through. Rest for a couple of minutes whilst you griddle the pitta bread on both sides then open up and fill with the chicken and salad. You only need to taste chimichurri once to change the way you grill forever. And when it comes to the homemade stuff, forget about it! Pure perfection with thousands of healthy and easy BBQ recipes, including these mouth-watering chicken kebabs! What’s great is how the marinade helps keep the chicken beautifully moist and tender. Better yet, these wonderful summer BBQ snacks are so simple to put together that even the kids can get involved! Healthy BBQ recipes the whole family will love with just a few simple ingredients!